Balancing Spontaneity with Structure - Composer David Dominique on His Recording "Mask"
David Dominique is a multi-faceted musician with advanced degrees in composition and theory and a background in indie rock, jazz, ska, and experimental improv. Based in Richmond and employed as an Assistant Professor of Music at William and Mary, Dominique maintains strong ties to the LA creative music scene. In this segment, he talks about his creative process and there are excerpts of several compositions from his recent album "Mask." Read more about Balancing Spontaneity with Structure - Composer David Dominique on His Recording "Mask"
Taylor Barnett is a jazz trumpeter, composer, assistant professor of music at VCU, and long-time member of No BS Brass. Justin Kauflin is an accomplished jazz pianist from Virginia Beach. In 2014, his friendship with iconic jazz musician Clark Terry was chronicled in an award winning documentary called Keep on Keepin’ on. Charles Overton is a native Richmonder and a former member of the American Youth Harp Ensemble (now the Greenspring American Youth Harp Ensemble). He’s based in Boston, having graduated from Berklee College of Music and he maintains an active career playing jazz, classical, world music and just about anything else that he finds an interest in. 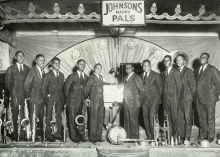 The Richmond Jazz Society, in partnership with the Valentine , has created a multi-media exhibit called “Virginia Jazz: The Early Years,” shedding light on 35 Virginia artists who have made significant contributions to the development of Jazz.